Part 3. Do annexations and mergers constitute economic growth? Not adjusting city job growth estimates for changes in city boundaries produces misleading estimates, especially when used for comparing and ranking cities. The Urban Institute’s recent report, Measuring Inclusion, focuses heavily on the relationship between economic growth and inclusiveness. Does economic growth promote inclusion? Is inclusiveness helpful for stimulating growth? These are clearly interesting and important questions. Setting aside for a moment whether city boundaries correspond to functional economies (they mostly don’t), a critical question is whether data reported for cities is comparable over time. The problem is that city boundaries often change from year to year. Some cities, especially suburban ones, grow through the steady addition of land via annexation. More rarely, but more sizably, some cities merge with their surrounding counties to form a new, and much larger jurisdiction. And importantly for time-series analysis, there are wide variations among cities in the contribution of mergers and annexations to growth: Many cities are land-locked (surrounded by other jurisdictions), or are in state’s where annexation is difficult and rare; while other cities–edge suburbs, are continually in the process of growing via annexation. Calculating employment growth rates without making allowance for the effects of boundary changes makes raw city growth data a very poor basis for comparing the economic health of cities over time. But, unfortunately, that’s exactly what the Urban Institute report does. Measuring Inclusion highlights four cities for case studies, based in part on their strong economic growth, measured using city boundaries. But three of these four case study cities–Louisville, Columbus, Ohio, and Midland, Texas, have all expanded significantly via annexation in the years covered by this study. As a result, we believe that it’s problematic to draw any lessons from these cities about the connections, or lack thereof, between economic success and inclusion, which is at the heart of the Urban Institute report. To get a sense of how this can affect the results, take a close look at the City of Louisville, which merged with surrounding Jefferson County in 2003. The UI report indicates that employment in the City of Louisville chalked up an extraordinary 150 percent job growth between 2000 and 2013. As Urban Institute reports, this was the fastest increase in employment in any city in the US, which resulted in Louisville having the fourth highest ranking on economic performance of any of the 274 cities UI examined. But this growth was driven entirely by the merger. Comparing employment totals for the old city limits in 2000 with the expanded county-wide totals in 2013 recasts the merger into economic growth. It’s actually quite easy to correct for this by comparing growth rates for a standard geography–Jefferson County–in both 2000 and 2013. 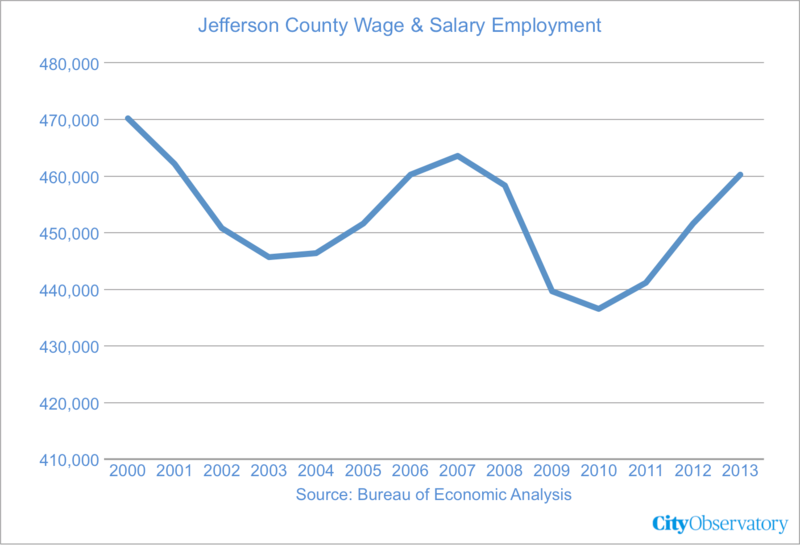 Below, we show the wage and salary employment totals reported by the Bureau of Economic Analysis for Jefferson County from 2000 to 2013. Rather than increasing by 151 percent, employment in the county actually decreased by 2.1% (falling by about 10,000, from 470,000 jobs in 2000 to 460,000 jobs in 2013). Once we correct for this boundary change, Louisville’s supposed employment growth goes from 1st fastest to 241st (out of 274). This also has a material effect on the city’s overall economic prosperity ranking. Rather than a positive z-score of 5.467, employment growth was -2.1 percent which translates into a is was z-score of -.788, which in turn lowers the city’s composite economic health score. The Urban Institute report ranks Louisville fourth overall based on a combined z-score for job growth, unemployment rate, vacancy rates and median family income. If we adjust just the job growth number to accurately reflect the decline in employment in Jefferson County, this lowers the overall economic health score from +1.29 to -.273; this lowers the Louisville economic health ranking from 4th highest to sub-par 185th (out of 274 cities studied). This is important because the study classifies Louisville as having experienced a recovery between 2000 and 2013 (it actually declined), and then makes the city one of four success stories selected for further analysis in the report. While Louisville’s city-county merger is the most dramatic example of how boundary changes can distort the meaningfulness and utility of raw employment growth rates, its clear that this affects a number of other cities as well. Two of the four other cities selected as examples of successful economic growth (Midland Texas and Columbus Ohio), have both had growth fueled by annexation. Midland, Texas has regularly annexed growing areas adjacent to its city boundaries. 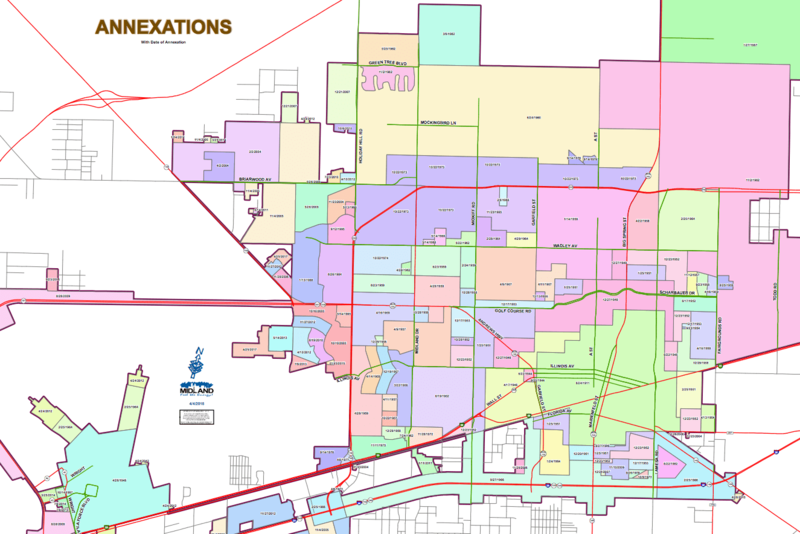 The city’s annexation map shows a patchwork of annexations. Columbus, Ohio, is another city that has expanded substantially by annexations. Since 2000, the city has added more than 8,500 acres through 400 annexations, expanding the total size of the city by about 6 percent. It’s much more difficult to tease out the contribution of annexations to job growth, but importantly, because some cities are annexing aggressively, while others aren’t, un-adjusted job data provide a poor basis for making cross-sectional comparisons. In sum, municipal boundaries are a poor choice for assessing economic performance, both because cities are incommensurable units, and, as this brief examination shows, annexations and mergers can easily distort growth statistics. As a result, the economic performance statistics reported in the Urban Institute report Measuring Inclusion, don’t provide a reliable or accurate indication of which cities are economically successful, and consequently don’t provide any reasonable basis for drawing conclusions about the connections between racial or economic inclusivity and economic performance.